I’m only posting this one because my husband loves Wendy’s. He grew up in Ohio and loves it. We don’t have one close by, I’m kinda glad because a square burger is just strange to me. 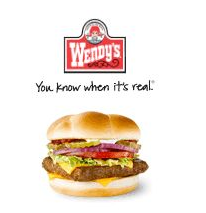 Head on over and grab your coupon for a FREE Wendy’s single burger with the purchase of a small fry and drink . This one won’t last long. I think there are a lot of people out there who love those square patties!